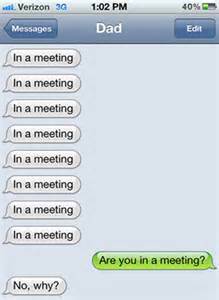 Texting at the Board of Ed Table: Private Message or FOILable? Both NYSSBA and Committee on Open Govt have addresed the issue. COOG issued an official case opinion on the subject. Hope this helps clarify the issue more fully for those interested. This is in response to your request for an advisory opinion regarding application of the Open Meetings Law to certain situations and the Freedom of Information Law to records generated during those situations. Please accept our apologies for the delay in responding to your request. More specifically, you inquired as to the propriety of members of a public body sending and receiving electronic communications during a public meeting, public officials engaging in private communications during meetings, and whether any records of such communications would be required to be disclosed. We offer the following comments in an effort to provide guidance. Based upon the foregoing, it is clear in our view that public bodies must conduct meetings in a manner that guarantees the public the ability to “be fully aware of” and “listen to” the deliberative process. Further, we believe that every statute, including the Open Meetings Law, must be implemented in a manner that gives effect to its intent. In this instance, the Board must in our view situate itself and conduct its meetings in a manner in which those in attendance can observe and hear the proceedings. This would include refraining from whispering or passing notes between or among members. With perhaps minor exceptions involving the receipt of personal or emergency communications, this would also include refraining from transmitting and receiving electronic messages and phone calls. If it were necessary to receive or send an electronic communication during the course of the meeting or to communicate by telephone, and if the communication is related to public business, we would recommend full disclosure to those present at the meeting. Conducting communications regarding public business privately, during a public meeting, in our opinion would be unreasonable and fail to comply with a basic requirement and intent of the Open Meetings Law. Second, there is no law that we are aware of that would prohibit a public official or employee from receiving or transmitting information through use of a personal electronic account, including email, instant messaging or texting, for example. While a publicly assigned account may have automatic logging and archiving capabilities, again, we know of no provision of law that would prohibit use of a private account. For an analysis of additional issues with respect to electronic communications and the Open Meetings Law, we have enclosed a copy of Advisory Opinion No. 3787. Based upon the language quoted above, documentary materials need not be in the physical possession of an agency, such as a school board, to constitute agency records; so long as they are produced, kept or filed for an agency, the law specifies and the courts have held that they constitute “agency records”, even if they are maintained apart from an agency’s premises. In a decision rendered by the Court of Appeals, the state’s highest court, it was found that materials received by a corporation providing services for a branch of the State University pursuant to a contract were kept on behalf of the University and constituted agency “records” falling within the coverage of the Freedom of Information Law. It is emphasized that the Court rejected “SUNY’s contention that disclosure turns on whether the requested information is in the physical possession of the agency”, for such a view “ignores the plain language of the FOIL definition of ‘records’ as information kept or held ‘by, with or for an agency'” [see Encore College Bookstores, Inc. v. Auxiliary Services Corporation of the State University of New York at Farmingdale, 87 NY 2d 410. 417 (1995)]. “The statutory definition of ‘record’ makes nothing turn on the purpose for which it relates. This conclusion accords with the spirit as well as the letter of the statute. For not only are the expanding boundaries of governmental activity increasingly difficult to draw, but in perception, if not in actuality, there is bound to be considerable crossover between governmental and nongovernmental activities, especially where both are carried on by the same person or persons” [Westchester-Rockland Newspapers v. Kimball, 50 NY2d 575, 581 (1980)]. The point made in the final sentence of the passage quoted above may be especially relevant, for there may be “considerable crossover” in the activities of school board officials. In our view, when those persons communicate with one another in writing in their capacities as school officials or with others, any such communications constitute agency records that fall within the framework of the Freedom of Information Law, even though they may be kept at locations other than school district offices. The definition of the term “record” also makes clear that electronic communications made or received by government officers and employees fall within the scope of the Freedom of Information Law. Based on its specific language, if information is maintained by or for an agency in some physical form, it constitutes a “record” subject to rights of access conferred by the Freedom of Information Law. The definition includes specific reference to computer tapes and discs, and it was held soon after the reenactment of the statute that “[i]nformation is increasingly being stored in computers and access to such data should not be restricted merely because it is not in printed form” [Babigian v. Evans, 427 NYS2d 688, 691 (1980); aff’d 97 AD2d 992 (1983); see also, Szikszay v. Buelow, 436 NYS2d 558 (1981)]. Whether information is stored on paper, on a computer tape, or in a computer, it constitutes a “record.” In short, email and text messages are merely means of transmitting information; presumably they can be captured and retained, and we believe that they must be treated in the same manner as traditional paper records for the purpose of their consideration under the Freedom of Information Law. Insofar as records exist, as a general matter, the Freedom of Information Law is based upon a presumption of access. Stated differently, all records of an agency are available, except to the extent that records or portions thereof fall within one or more grounds for denial appearing in §87(2)(a) through (k) of the Law. In view of the foregoing, records cannot be destroyed without the consent of the Commissioner of Education, and school district officials cannot destroy or dispose of records until the minimum period for the retention of the records has been reached. The provisions relating to the retention and disposal of records are carried out by a unit of the State Education Department, the State Archives. In light of a municipality’s responsibility to retain records for certain periods, perhaps it would be wise to adopt a policy applicable to those instances in which public officials and employees utilize home or personal accounts to conduct public business, to require that copies of such communications be forwarded to the municipality’s records management officer on a regular basis. In cases where personal accounts are utilized for public business, perhaps periodic transmissions would alleviate both the public’s concern that records were hidden and the clerk’s responsibility to request copies for retention purposes, as outlined above. Finally, in response to your comment regarding the use of a recording device during an executive session, we enclose a copy of a previously issued Advisory Opinion No. 2807 that addressed those issues in great detail. On behalf of the Committee on Open Government, we hope that this is helpful.